Our office is considered by many to be one of the most high-tech practices in the country. We are paperless, treat all cases through the microscope, and take all radiographs with digital technology. We are committed to bringing the most recent technological advances in both endodontics and dental implants to our practice on a continuous basis. Our practice philosophy is to bring a level of customer service to the Mid- Michigan area that is unsurpassed. We appreciate that you or your general dentist have selected our office, and we assure you that we realize that "WE WORK FOR YOU". Every effort will be made to make your visit to our office comfortable, and yes...maybe even fun! 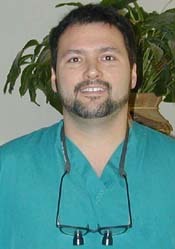 Dr. Mullin is from Sault Saint Marie, and practiced general dentistry there from 1991-1994. He is an Alumnus of Lake Superior State University, The University of Michigan (sorry green and white), and The University of Maryland. He is married to Julie, and has four adult children. At Greater Lansing Endodontics PLC, our goal is to provide our patients with the finest endodontic and dental implant treatment available anywhere. We go to great lengths to make your visit here comfortable and painless. Our staff is highly trained, and we are not happy unless your expectations are met or exceeded. We believe that perfection is expected and excellence is accepted. Please notify us if we have fallen short during any portion of your interaction with our office. Dr. Mullin prides himself on his quest for continuing education. He attends thousands of hours of professional development courses to further himself in the science of endodontics and implantology. He will take the necessary time with each patient to explain their dental treatment options so that they're comfortable with the recommended dental treatment. Dr. Mullin works closely with the patient's general dentist to ensure that the recommended treatment is agreed upon by all parties. These wonderful ladies make up our GLE Team. They bring compassion, hard work, attention to detail and excellence to a new level. Their commitment to the dental world of endodontics, implantology and patient care are second to none and we are confident you will agree when you meet them. Greater Lansing Endodontics is very fortunate to have this world class dental team. Thank you for your kindness and professional treatment. You helped me through a tough experience. You made it as pleasant and as comfortable as humanly possible and I am really grateful! You possess "big city" technical expertise and have a "small town" touch. I felt very comfortable in your hands. I just want to let you know I appreciate the time and hard work you put in, trying to save my tooth. I am grateful for the treatment that has been done. Just wanted to thank you and your staff for a consistant, joyful disposition. I'm sure many people, including myself, come in gripped with fears - thank you for all the humor and kind faces! These days it makes all the difference. Keep up the good work and I will recommend you to everyone I know. Yes, I brought the thank you card with me, because I was so impressed the first time I was here! Great job! I am writing to let you know how well my Dad's appointment went with your office and your wonderful staff. Dad enjoyed his visit from the beginning of his introduction at the front desk to the dental operatory room. The staff at your office made us feel right at home and completely welcome. The interactions with the dental assistants and the front desk staff, as well as Dr. Mullins, were absolutely unparalleled. We entered a successful TEAM and family treatment facility, not just a DOCTORS office. It was wonderful to be able to talk to you. We were not TALKED AT, but rather spoken with. You included my father on all decision making processes and were very thorough about informing my father and me about all the treatment planning decisions. The entire staff made my Dad feel like a part of the process and as a welcome part of their dental TEAM. IT is truly refreshing to have been in a dental office that was patient, friendly, professional and with a great sense of humor! I am a dental hygienist and have worked in many different settings in the past 30+ years. I am always impressed when I encounter an office that is personal, professional and provides quality dentistry. My father experienced endodontic treatment at its best! Root canals are generally not considered a pleasant thought, not to mention a pleasant experience for your average patient. My father and I both experienced a wonderful treatment plan, and follow up with you and your staff. Thank you again for making Dad's RCT pleasant and comfortable! You sold him completely! You have a wonderful staff! You are the "BEST"!! I just wanted to write and thank you for the wonderful care I had during my 2 visits to your office. You were so friendly and caring, as was your staff. Again, thank you for the wonderful care - it is very much appreciated. I wanted to take an extra moment to send extra praise and thank you's for all the patience, humor compassion, and care that you gave me when I was in pain and felt most vulnerable. You all went out of your way to meet my needs and repair my teeth in the best professional manner I've seen in a long time! I say nothing but nice things when I speak of your staff to friends and family. No offense but hopefully you guys won't have to see me again! But if I do you are the first crew I will wnat working on my teeth! Thanks again Marian S.
Dear Dr Mullin & Staff I came in on Friday as an emergency. You were kind enough to see me. You took very good care of me and your kindness showed in everything you did.You found the problem and made sure it got taken care of that day! It feels good to be out of pain. I can't thank you enough.